BellHawk Systems specializes in providing real-time work-in-process and materials tracking systems based on license-plate container tracking principles. These specialized capabilities are only needed by a limited number of industrial organizations including advanced manufacturing, engineering, repair, construction, and defense organizations. They are also needed by food and pharmaceutical processors, as well as distribution organizations that do secondary operations such as kitting, repacking and relabeling. BellHawk does not compete with ERP, Accounting, Warehouse Management (WMS) and Manufacturing Execution Systems (MES) which also do inventory and production tracking. In many cases, these systems provide all the operations management and inventory tracking capabilities that industrial organizations need. But where there is a need for the special capabilities provided by the use of license-plate container tracking methods, then BellHawk Systems strives to be the premier provider of both SaaS (Software as a Service) solutions in the Cloud and on-site installation of these tracking systems in a client's own plant. 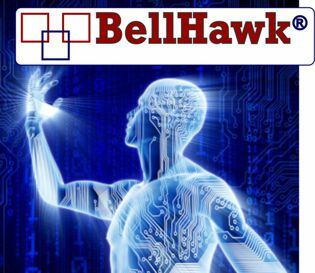 BellHawk is designed to be used with a wide range of ERP and accounting systems and has an array of interfaces that can be used by clients to implement automated data exchange interfaces with BellHawk. It is also designed to be used with a wide range of mobile computers, barcode scanners, and printers so as to facilitate quick and easy deployment of tracking system. BellHawk is designed to be easy to use and is priced at a level that even small organizations find affordable. Yet, at the same time, BellHawk integrates a range of features needed by large multi-national organizations.